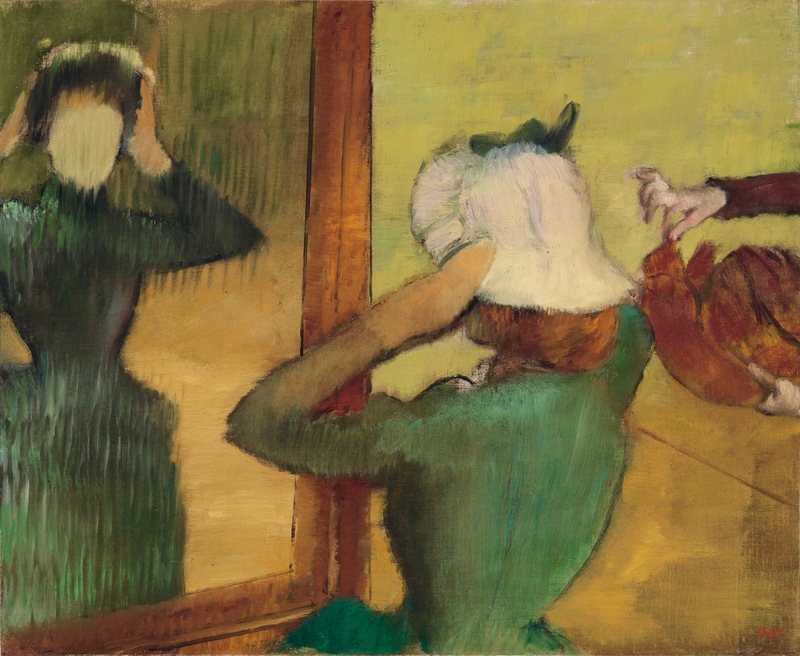 Edgar Degas, a brilliant and strange man, painted numerous pictures of women in hat shops. This ‘At the Milliner’ (circa 1882-85) is perhaps the spookiest. But what does it mean? In the Degas painting “At the Milliner” (above), why is the woman’s face a blank? The picture is one of many striking pieces in the current art exhibit at The Frick Pittsburgh. The show—titled Van Gogh, Monet, Degas, to highlight a few of the big-name artists who are featured—comes from the Mellon Collection at the Virginia Museum of Fine Arts, in Richmond. It’s a fine sampling of French art during the 1800s and early 1900s. And visitors coursing through the show tend to make a full stop at the lady looking into a mirror. Viewers over the years have floated theories about the significance of the whited-out face. Stylish hats and hat shops were hugely popular in Paris in the 1880s, so one idea says that Degas painted an ironic comment on the depersonalizing effect of the era’s consumerism. Which is plausible. But here’s another reading. Maybe the woman represents France. Maybe she sees a blank reflection because she doesn’t know who she is—just as the nation, during that turbulent century, often didn’t know what it was or what it would become. For openers, the French Revolution at the end of the 1700s shook up the sociopolitical order but didn’t settle it. More revolutions, coups, and rebellions lay ahead. Between 1800 and 1871 France was, in this order: a chaotic republic; a seat of empire ruled by Napoleon; a troubled monarchy under successive rival kings; briefly a republic again, but then an imperial entity again (under Napoleon’s nephew Louis-Napoleon), and then—after that emperor managed to be captured by the Prussians—a war-ravaged Third Republic with rebels who very briefly turned the capital, Paris, into a radical socialist commune. Amazingly, through all the turmoil, France remained a global center of the arts and sciences. After 1871 the country enjoyed a few decades of peace at last, the so-called Belle Époque. It was an epoch marked by further great advances in art and science—though also disrupted by the crazy boom-and-bust cycles of the new industrial economy, and the social upheavals that came with it. Degas made his perplexing painting in the early 1880s. Small wonder that the Frenchwoman saw herself as a blank slate. A new age was afoot, full of wondrous possibilities to be tried on, and yet an age when perils lurked. Notice the claw-like hands of the milliner reaching into the frame. You can almost hear her cackle, like the Wicked Witch of the West: “Try this one, dearie!” And sure enough, the horrors of the First World War loomed not far around the bend. The Van Gogh, Monet, Degas show is worth seeing just for the quality of the art, but it’s a mini-tour of art history as well. The pieces are selected snapshots of the French artistic ferment that led to the art of our present times. Painted during Van Gogh’s final great surges of work, ‘The Wheat Field behind St. Paul’s Hospital, St. Rémy’ stirs the senses. 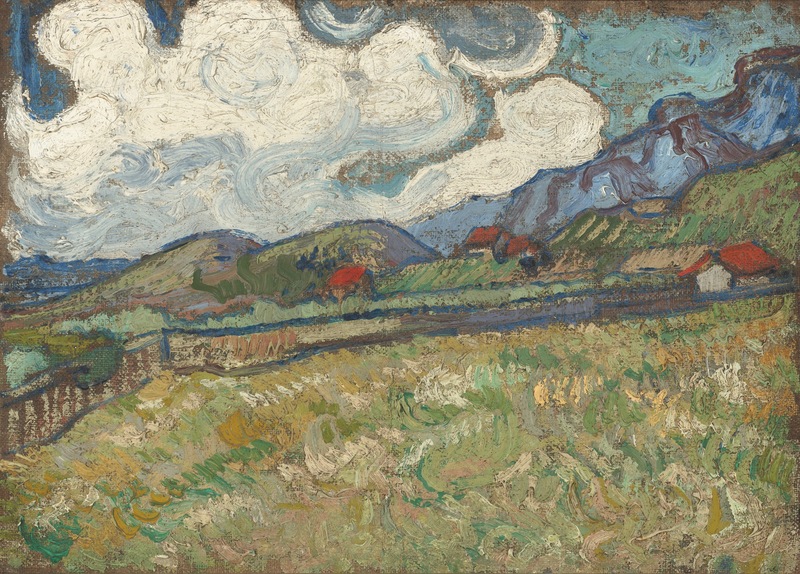 The “Wheat Field,” painted around the same time, in 1889, is a nearly identical view from Van Gogh’s hospital window. Although it’s missing the imaginary church and village he dubbed into the foreground of “Starry Night,” it shows the same line of hills rising in the distance. Being a daytime scene, it has massive swirling clouds instead of a swirling night sky. And though few paintings match the magical brilliance of “Starry Night,” the “Wheat Field” is in a similar vein, with Van Gogh using his vigorous brushstrokes to channel the vigor of nature. A next-generation painter who carried that approach to the next level was Maurice de Vlaminck. He idolized Van Gogh’s work and, it seems, strove to out-vigor the master. Vlaminck’s “Sailing Boat, Chatou” (circa 1906) is a veritable daub-fest of bright colors. The sailboat rides on a river ablaze in chunky chunks of variegated blue, while the chunky vegetation at the river’s edge erupts into a brutally phallic-looking tree. Vlaminck was part of a movement called the Fauves—literally, the “wild beasts.” This painting shows why. Now let’s dial back in time to the 1870s. Before Van Gogh’s peak years, the Impressionist painters were among the first to break from the “academic” high-art tradition of painting lofty subject matter (e.g., military heroes and mythical scenes, not landscapes and hat shops) in a hyper-realistically precise way. Impressionists didn’t do that, and they are represented strongly in the show: Claude Monet was a founding member of the group, later joined by the extremely contrary Edgar Degas, who insisted he wasn’t actually an Impressionist but took part in their Paris exhibits. The Frick show has some little-known Impressionist gems. They include Monet’s “Irises by a Pond”—a cool purple counterpart to his popular water lily paintings—and my favorite, pond-wise, “The Watering Pond at Marly with Hoarfrost” by Alfred Sisley. Sisley’s painting, done in 1876, is more like a townscape (if there’s such a word). It looks across a corner of the pond and an open field to the houses of little Marly-le-Roi. And it demonstrates, marvelously, the Impressionist trick of using soft touches and tones, rather than fussy detail, to bring a picture alive. Everything is in ethereal colors—pale blue pond water and frost on the field; ivory houses with blue-grey roofs—and all is bathed in the golden haze of a low, slanting wintertime sun. You can feel the air. You might even sense the sunlight glancing off your cheek, as Sisley must have when he stood there long ago. Henri Rousseau’s 1910 ‘Tropical Landscape’—subtitled ‘an American Indian Struggling with a Gorilla’—comes from a realm far beyond logic. Now for something completely different! Henri Rousseau, self-taught and never schooled in art, painted bizarre events unfolding in florid jungles that he’d never seen. During Rousseau’s life, critics and commoners laughed at his work. On my tour of the The Frick, I too laughed and so did other visitors when we saw his “Tropical Landscape: an American Indian Struggling with a Gorilla.” The difference is that today we’re laughing in delight at the oddball genius. 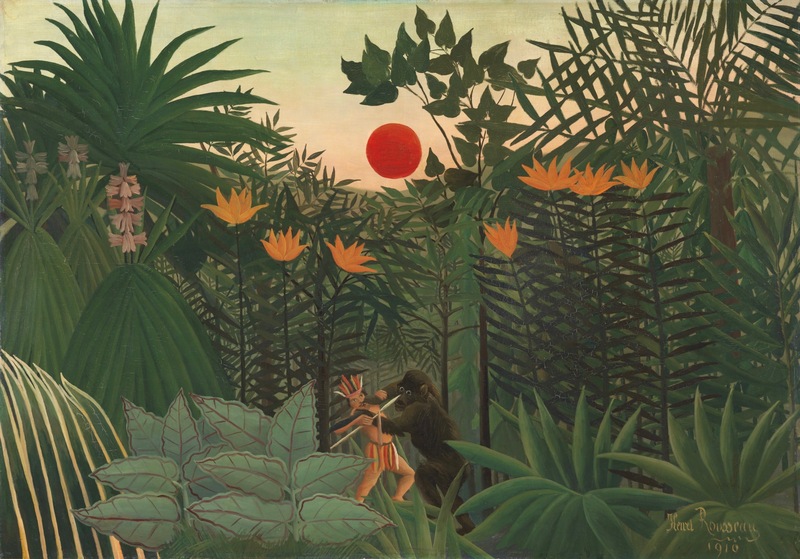 Rousseau’s improbable visions have become iconic worldwide. Most fans, however, get to see the paintings only in reproductions. The real thing is an order of magnitude better. “Tropical Landscape” is BIG, almost six feet by four. It delivers the exotic goods right to your eyeballs’ front porch. And last but not least we have the Degas sculpture “Little Dancer Aged Fourteen.” This piece, like many in the show, fits the category of must-be-seen-live. The figure is cast in bronze but wears a cloth skirt and silk hair ribbon. She is mounted on a pedestal, which elevates her petite form up to adult eye level and invites you to walk around her, admiring her graceful-yet-powerful pose from all angles. 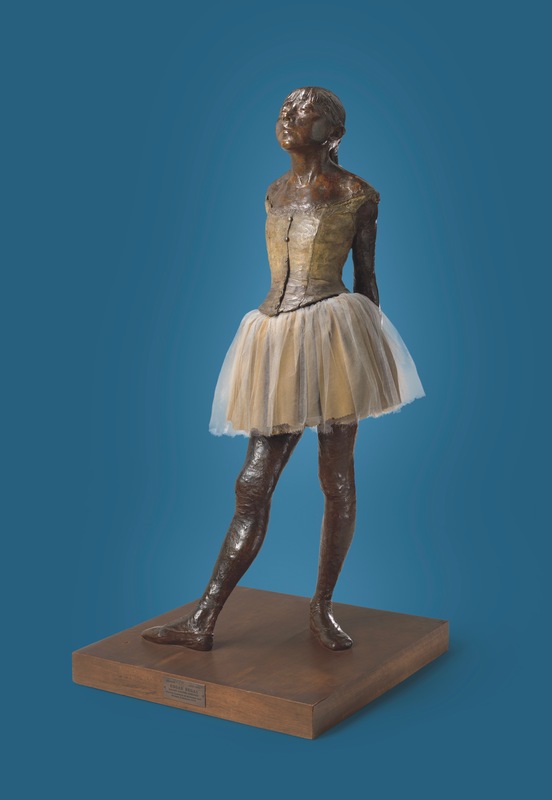 Feminine and formidable: Degas sculpted ‘Little Dancer Aged Fourteen’ in wax around 1880; this bronze was cast in 1922. Further, the form and pose may set off some eerie visual echoes. You may think you’ve seen something like it somewhere else, quite recently. That’s because you have. The late Paul Mellon and his wife Rachel Lambert Mellon collected the artworks displayed in Van Gogh, Monet, Degas. The pieces are among nearly 1,800 that the Mellons graciously donated to the Virginia Museum of Fine Arts. That museum’s staff, in turn, organized the show to put it on tour. Van Gogh, Monet, Degas runs through July 15. Advance reservations and a moderate admission fee are required. Visit The Frick Pittsburgh on the web for tickets. (Also keep in mind that other attractions at The Frick are free, so your ticket effectively buys you more than entry to the exhibit.) In the Frick Art Museum, 7227 Reynolds St., Point Breeze. Image credits: “At the Milliner,” “Tropical Landscape,” and “Little Dancer Aged Fourteen,” photos by Travis Fullerton. “The Wheat Field Behind St. Paul’s Hospital, St. Rémy,” photo by Katherine Wetzel. The depicted artworks are from the Virginia Museum of Fine Arts, Richmond, and the images are © Virginia Museum of Fine Arts. Mike Vargo, a Pittsburgh-based freelance writer, covers visual art and theater for Entertainment Central.